In a world of possibility for us all, our personal visions help lay the groundwork for political action. As of 12 March 2018, we are in the post-strike landscape. The terms of the ‘agreement’ reached yesterday are unsatisfactory and the outcome has demonstrated the extent of the leadership crisis in the sector. Neither UUK nor UCU has effectively represented us nor addressed the issues that caused the pension dispute in the first place, not to mention their wider context. In a time when the sector has never been more flush, in which tuition fees have driven raises for vice-chancellors at the expense of staff and students who have been subjected to austerity policies, stripping them of their learning and working conditions, respectively, and saddling students with crippling debt. These problems can no longer be ignored. We cannot go back to the way things were before. UK HE must be fundamentally transformed. The agreement’s apparent compromise is in fact clearly founded upon a tacit acceptance of the deficit model of the health of the pension scheme, a model which UCU itself has explicitly rejected and which is not reflected in the September valuation. Thus, if the scheme were not in deficit, the agreement to higher contributions and a lowered threshold should never have been made. Further, UCU negotiators have sold the membership out by agreeing to encourage us to reschedule teaching. To put that sentiment to paper is to engage in a management exercise of exploiting the workers who have agreed to withdraw their labour in the hope for better working conditions. Rescheduling classes means that the most junior, most precarious members of our sector will be hit the hardest, many of whom are women, people of colour, and hourly paid. The proposed three year transitional agreement simply delays the finding of a genuine solution to the problem, while it is likely that after three more years of increasingly poor conditions, we would be demobilised and de-energised, and easily pressured into accepting something even worse. The poor outcomes of yesterday’s ACAS talks have motivated us to underscore our demands to return to the September valuation and to dismantle UUK; in addition, we further call upon the UK government to underwrite the USS pension scheme in the same vein as the Teacher’s Pension Scheme. Universities and the knowledge they produce are a public good and should be treated as such. We will accept nothing less. 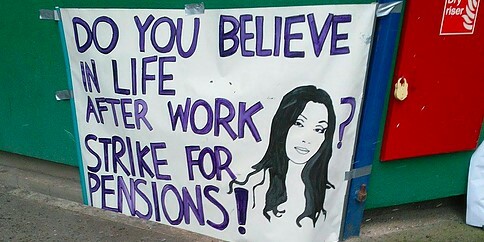 While the union-led rolling strike and concomitant campaign against pension reforms are laudable in their mobilisation of thousands of staff, supported by student activists from across 68 universities, to enact unprecedented industrial action, we argue that it still falls short of its potential to address the wider problems within the sector. Some of these problems, such as the reproduction of intersecting white supremacy, gender bias and class oppression, are historical, normative, and generally unacknowledged. Others, such as the neoliberal ideological framework that enables and encourages the unbridled marketization of all sectors, are given lip service but have not been meaningfully addressed in the ongoing discussion around protecting pensions. A marketized education system has prioritised profit and growth over all else and is unjust in many ways: it relies on the casualisation of labour and the precarity of employees, it follows the US model to charge of outrageous student fees that produce debilitating debt, and allows the the exorbitant remuneration of senior management in universities and USS, the pensions body (482% more in 2017 than 2008). The tools for structuring the HE market include various accreditation and ranking mechanisms such as the REF, TEF and the upcoming KEF (Knowledge Exchange Framework), which are widely acknowledged to be gamified and thus useless as measures of quality or legitimacy. While the proposals UCU has tabled at initial ACAS talks (which were surprisingly brought forward after UUK was directly engaged via Twitter on Monday night) are sensible, there is a general lack of organising to form demands or even a position statement that goes beyond protecting pensions to firmly place the pension fight in the broader context of neoliberalism. Pensions law specialist Ewan McGaughey takes a useful corporate governance perspective that moves us closer to imagining what a post-strike list of demands might look like, which we have built upon in some of our demands below. However, a significant limitation of this work is its implicit assumption that equitable governance is even possible within the existing framework. Drawing upon the critique offered by Audre Lorde, we are doubtful that the master’s tools can be used to dismantle the master’s house. Accountability reform. The way universities, related bodies such as USS, and their leadership are held accountable must be completely reevaluated. Some suggestions to this end include: Each governing body should have a staff and student-elected majority. USS board members with potentially conflicting professional backgrounds should stand down, and the board should be comprised of a majority of staff members through direct election. VCs should not sit on committees that determine their own compensation. Dismantle REF and TEF and KEF. We take a stand against ranking knowledge and learning. We call for the dismantling of these ranking systems which serve as mechanisms for marketisation and have exacerbated historical exclusions and promoted unfair concentrations of what is deemed valuable knowledge / teaching.The REF attributes value to and circulates masculinist knowledge that is Euro-American-centric, dominated by white enclaves and English-fluency. We call for communities of scholars who are able to freely engage in debate and critique, who are charged with developing intellectual integrity through scholarly communities rather than self-defining excellence in their discipline. Underpinning these communities should be open access publishing, interdisciplinary debate and knowledge circulation that is free of subscription costs to readers anywhere in the world. To de-centralise the Eurocentricity and North American dominance that excludes scholarship from the Global South, we call upon North American, European and Australian governments and universities to fund bi-directional visiting scholarship positions for academics to engage internationally, and to create equitable platforms for Global South and non-English language scholars, including supporting the publication and translation of scholarship in languages other than English / other European languages.Teaching evaluation is a process of learning for both teacher and student, and therefore needs to be integrated into the everyday practice and organisation of each university without using it for performance management to discipline workers or equating it with a fee structure that inhibits a student’s equal access to learning institutions. The TEF is a management tool being used to inflate fees and manage workers; it is also a mechanism that demands student grades be inflated as some kind of measure of success or excellence. Of the many problems with this formulation, we note here that this tool has been developed despite teaching quality and evaluation mechanisms already existing in universities. Staff-student liaison committees that are already in place should be used to enhance transparency and accountability. For example, they could be made into open forums for debate and discussion, student reps could be mentored and shown how to canvas and reflect more clearly the interests of body of students they are elected to represent. Staff should be regularly consulted to ascertain key issues that are detrimental to teaching and should be given the agency, management and/or administrative support to address the challenges. Bureaucratic processes that impede this should be identified and redesigned to support improvements to learning conditions rather than to inflate grades.Knowledge exchange should be disentangled from business interests. If, as stated above, knowledge is made unequivocally open access, industry representatives will be able to access it as easily as anybody else. Universities were designed to educate the public, not to help corporations increase their profits. We attribute this turn in purpose to the unbridled capitalism and corporate greed that has shaped our current global economy and which is fundamentally unsustainable. Government to underwrite our pensions. There is a moral crisis across the U.K. public service sector. Successive governments have sought to reduce public spending on public goods, such as education and the national health service, arguing that austerity measures are required to promote a healthy level of debt. The status of a public good and indeed the value of it being public, and therefore accessible to all, has been attacked by ideologues who perceive government oversight as overreach and unnecessary, arguing instead that the market will unfreeze entrepreneurial ability and lead to a leaner and more efficient organizing for delivering public service. However, there is little evidence supporting that eradicating public funding for public services improves quality of the services or of working standards (see railways as a case in point). A marketised public good follows a profit-seeking logic, thus necessarily exploiting workers to drive up levels of savings that fund executive administration that is charged with the responsibility to create systems of accounting and rankings that produce market value. Thus, the imperative to support a social good is undermined by a profit-seeking management elite vested with interests to make higher education a commodity that may be deemed ‘valuable’ only in monetary ways. We demand that public goods are no longer privatised, commodified or put on the market. We demand that our public goods are protected from market forces, from competition and from profit-seeking imperatives and that the U.K. government underwrites risk to our pensions because the sector provides a public service that must be protected from profit-driven motives. The original version of this piece first appeared on Left of Brown and Sisters of Resistance on 7 March 2018; this updated version appeared as ‘The Post-Strike Landscape 2’ on 12 March 2018 and is reposted here with permission. Left of Brown is a blog written by a woman of colour working in the U.K. higher education sector. Sisters of Resistance is an international group of revolutionary queer intersectional feminist women of colour, working together to resist the tide of oppression everywhere. Can’t nobody hold us down. Let’s get free.